By: Joe Latti, Brick City Boxing – The stars were out Friday night at Madison Square Garden as Roc Nation Sports kicked off the first edition of their “Throne Boxing” series. The event was televised by Fox Sports 1 and hosted by famous New York radio personalities Angie Martinez and DJ Mustard with Michael Buffer doing the pre-fight introductions. Rapper and New York City native Fabolous put on a performance in the ring before the main event. Some of the guests scattered around ringside included Jay Z, Rihanna, Jake Gyllenhaal, CC Sabathia, Victor Cruz, Winky Wright, Bryant Jennings, Rosie Perez, Paulie Malignaggi, and the newest boxer to the Roc Nation Sports family Andre Ward, who was signed to a deal just hours before the event. The main event featured Dusty Hernandez-Harrison (25-0, 13 KOs) in a dominant victory by decision over New York fan favorite Tommy Rainone (22-6-1, 4 KOs). The bout started off with light action in the first frame, a round which could have went either way. As the fight progressed Hernandez-Harrison started to get more comfortable showing good range and counter punching, as well as doing some damage fighting on the inside – a move not typical of the taller boxer. 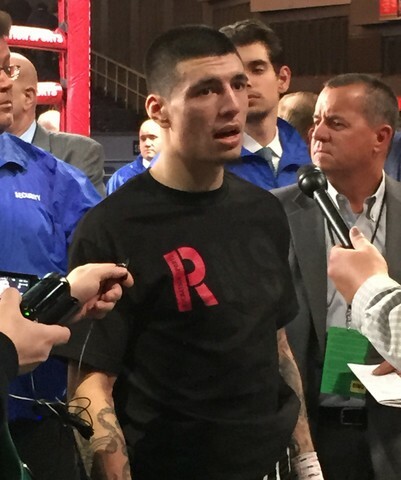 The trend continued and Rainone looked to be hurt in the 5th and 7th rounds after a big connections from Hernandez-Harrison, but in true Tommy Rainone fashion he could not be stopped and this bout went to the score cards. Two judges scored the bout 100-90, and one had it 99-91 all in favor of Dusty Hernandez-Harrison. The co-feature included Tureano Johnson (17-1, 12 KOs) with a dominating performance over Alex Theran (17-2, 9 KOs) for the vacant WBC Silver & WBA International Middleweight titles. Johnson showed he was the more polished and powerful boxer from the start and never looked back. The 30-year-old from the Bahamas dropped Theran twice in the fifth round, and the bout was eventually stopped 0:01 into the 6th round by the medical staff. Johnson’s only loss was a controversial stoppage against Curtis Stevens last April, be sure to keep an eye out as he looks to be a possible headliner in the near future. The 4 round TV swing bout featured two young boxers out of New Jersey. Dustin Fleischer(1-0, 1 KO) of Monmouth Beach tmade his pro debut against Frank Jordan (0-3) of Elizabeth. Fleischer, the taller and quicker boxer, wasted no time trying to impress in his debut and flourished with his power and body punches. This one didn’t last long as the bout was stopped 1:27 into the 2nd round. This battle between two undefeated boxers started off even with Odom eventually taking control in the middle of the 2nd round, and giving Hernandez a bad cut over his right eye in the 3rd. Odom continued that dominance into the 4th round, forcing Hernandez down to a knee but landed two big shots while Hernandez was down, laying him out on the canvas. This would warrant a disqualification 0:30 into the 4th round of the bout in favor of Andrew Hernandez. Sims dominated this bout from start to finish. The 21 year old from Chicago swept all 6 rounds on the score cards (60-54 x 3) and remains undefeated. McCalla came into this bout overweight at Thursday’s weigh in, which voided his chance of winning the vacant IBF International Welterweight Championship against Freddie Roach’s boxer Chris Van Heerden. This proved to be one of the most entertaining bouts of the night, as the momentum changed ways numerous times throughout all 10 rounds. The judges saw this differently, as one scored in favor of McCalla 99-91, while the other two scored it 96-94 and 97-93 in favor of Van Heerden. Chicago native Eduardo Martinez with a dominant 5 round performance, while cutting Miranda in the 4th and preserving his undefeated record. Judges scored this bout 40-36, 39-37 and 39-37 all in favor of Martinez. This bout was all Romero as he went to work quickly, knocking out Kreischer via a left hook 1:24 into the first round.